The large chunk of cement came hurtling through the display window shortly after her guests closed the curtain. “I was in the back and I heard the crash,” says Ciera Mckissick. The unexpected act of violence happened in February 2017, less than a month after she opened the doors of her gallery and arts incubator at 2151 W. 21st Street in Pilsen to the public. She is one of a growing number of newcomers who have moved to the neighborhood in recent years, attracted, in part, by its history of activism and its reputation as a center for artistic expression. It came crashing into what she intended to be a safe environment for creative people from all backgrounds. That day, she was hosting a long series of queer-positive performances, meditations, and workshops. Ciera Mckissick isn’t sure what motivated the man who did it. Maybe he didn’t like that she and her friends are queer. Maybe he didn’t like that she opened her new gallery in Pilsen. Or maybe he was just drunk and being a jerk. Whatever his motivation, Mckissick shrugs it off. "It just lets you know the importance and the need for spaces like this,” she says. 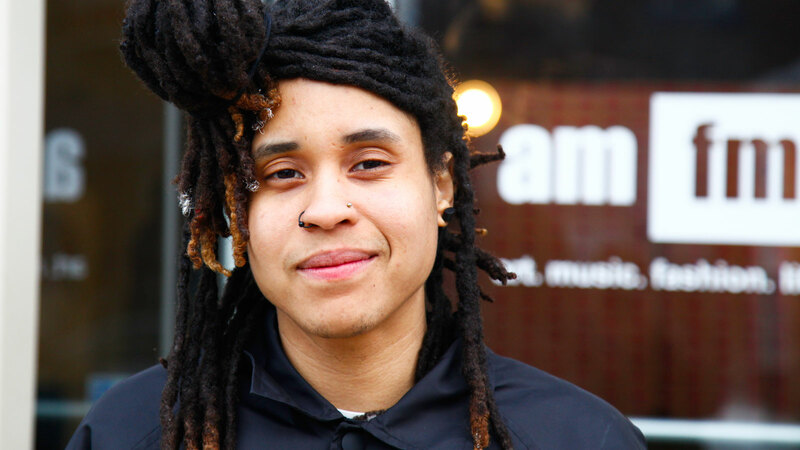 Mckissick moved to Pilsen three years ago from her hometown of Milwaukee, Wisconsin, where she was running an online arts, music, and fashion magazine. Since moving to Chicago, her brand AMFM has grown into what is now a gallery and incubator for emerging artists, musicians, designers, and other creative types, a place where people can “showcase their work and their passions and cultivate community,” she says. For a time, she organized events at Cultura en Pilsen, a non-profit arts organization that was located at 1900 S. Carpenter for years. But in the summer of 2016, the landlord doubled the rent and the organization couldn’t afford to stay. Mckissick quickly pivoted to pop-ups. It took more time and energy to pull things together, but it allowed her to continue curating events and providing a space to celebrate non-traditional arts and people. The rootlessness also helped her to expand her network. But it was always her goal to have her own place – not only for her own work and events, but for others, particularly people who might not feel safe or empowered or established enough to approach more traditional venues. And ideally, she says, she wanted to find that space in Pilsen. She loves that it feels like a real community, where people know each other and support one another. “Maybe it’s the community-based, grassroots feel of the neighborhood,” says Mckissick, or the murals by such artists as Sam Kirk and Sandra Antongiorgi that she fell in love with the first time she visited the neighborhood. "I am not just looking for real estate…I am looking to build community through the arts. I do most of my work in Pilsen because of the vibrant art, culture, community, and working-class citizens I am surrounded and inspired by." Days before her grand opening celebration, which featured more than a dozen artists and musicians, she introduced herself to her neighbors to let them know what was coming. She wasn’t sure what to expect, but says she was welcomed with open arms. “A lot of people in the community have been like, ‘We’re so glad you’re here, thank you so much,’” she said. The nearby liquor stores, she said, have been particularly enthusiastic. “They get a ton of support whenever we have events,” she says. And they have no shortage of events – from their monthly jazz series to a revolving door of art shows and after-parties, at times packed wall-to-wall with people. In May, two young men who live across the street will have one of their first public shows at AMFM. Having her window smashed just after arriving was shocking, says McKissick, but the thing that has encouraged her to stay was the community response. Friends pitched in that night to patch the window with plywood and, within days, raised money to replace the broken window.